Digital cameras are an integral part of all photo ID programs. We will help you choose a cost-effective camera that will produce the image quality needed for a successful program. We can supplement the value of your camera with accessories including backdrops, ID card printers, custom card software programs, ID card readers, electronic signature pads and more. 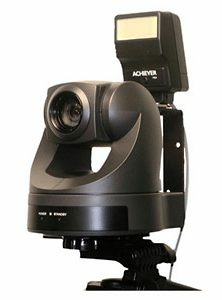 Photo ID Camera Solutions The Higgins CV24 Photo ID Camera is ideal for cost conscious customers that need a reliable and long-life photo ID camera. The Higgins CV24 is a compact camera that captures high quality photo images. Quality photos are a key component of a photo ID system. Using WDM, TWAIN or DirectX, the camera integrates with most Photo ID software applications. Unlike consumer cameras, the CV24 will last for many years and includes a one-year factory warranty.